A first impression of the books use of many three syllable words, some of which must be googled to understand, is that this is not a dime store type novel. The prose suggests an author who has been exposed to literary excellence, probably in a prestigious back east university. That would be an apt description of Sinclair Lewis who had grown up in Sauk Center Minnesota. The novel Main Street, takes place in Gopher Prairie Minnesota which is modeled after Sinclair’s Sauk Center birthplace. Sinclair obviously understood the eccentricities small towns of the upper Midwest in great detail and found it wanting after being exposed to the wider world. Sinclair’s descriptions of the town of Gopher Prairie in the protagonist Carols voice was, “In all the town not one building save the Ionic bank, not a dozen buildings which suggested that in the fifty years of Gopher Prairie’s existence, the citizens had realized that it was neither desirable or possible to make this, their common home, amusing or attractive.” Sinclair’s opinion of the inhabitants was similar, “Carol discovered that conversation did not exist in Gopher Prairie. Even the young smart set, the hunting squire set, the respectable intellectual set, and the solid financial set, they sat up with gaiety as with a corpse.” Sinclair’s descriptions looked at the underside of the noble pioneers who wrested the land from its natural state to subject it to their will and to claim it as their own. From Sinclair’s description the result had been the planting of ugly little towns inhabited by intellectually impaired people. That Sinclair Lewis, a Midwestern small town reared boy was the first American to receive the Noble prize for literature belies Sinclair’s theses. However, believe that gifted small town youths migrate to large population centers is valid. The flotsam remains. 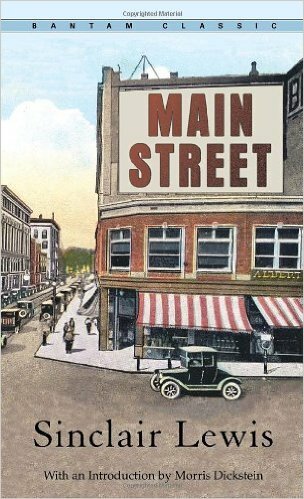 It is interesting that the appearance of Midwestern small towns has, if anything, deteriorated during the approximately hundred years since Main Street was first published. The remaining buildings are a hundred years older and in need of maintenance, many buildings are gone and not replaced. Any new structures are usually built on the outskirts of the towns using prebuilt low cost construction methods that have a forlorn appearance on opening day. Sinclair Lewis’s described the pettiness of small town intrigues and jealousies. There is no upside to Midwest small towns in Main Street, yet Carol returns to Gopher Prairie, accepts it for what it is and knowing that she will not be able to change it except maybe around the edges. Having grown up in the Gopher Prairie type environment I found the story interesting for that reason. Beyond that, Sinclair is a skilled writer. His character and place descriptions are exceptional and he brings tension and anticipation to otherwise ordinary events.